In the best cases, we find applications in which the residuals replace high-value primary raw materials: this is where the greatest sustainability benefit lies. 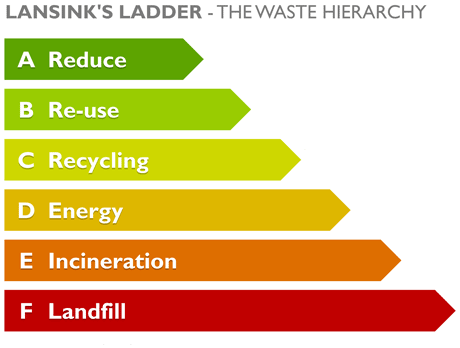 We have Lansink’s ladder in mind: at least 99.9% of the residuals we receive find useful applications and only 0.1% end up as landfill. A little less than one-fifth is used as construction material in infrastructural works and the remainder is recycled at a high or higher level of quality. The 100% calcite lime pellet we developed with our partners over the last few years resulted, in ground form, in a pure lime that is suitable for a variety of high-value applications. In 2015, successful tests were carried out for the reuse of ground calcite pellets as a seeding material in water softening; a milestone for the sector, since the residual is not recycled but reused in its original application: yet a rung higher on Lansink’s ladder. Cradle to Cradle®, as the name implies, refers to keeping raw materials within a closed loop. We embrace this philosophy and avoid, whenever possible, having residuals being dumped after single usage. About 40% of the residuals are directed to applications in which the material flows back into the resource loop. Lime pellets are thus incorporated into the biological loop in the form of consumer-use lime, and lime pellets for the glass industry ultimately end up in recycled glass (technical loop). Cradle to Cradle® applications don’t always (immediately) lead to the greatest environmental benefit. For example, a relatively high amount of energy is required to dry and grind calcite pellets to make seeding material or high-value ground lime; in any event, more than is required in the large-scale industrial production of ground lime from limestone. But whenever we expect to reap a sustainability future benefit, we are willing to accept such temporary drawbacks. The EPEA Cradle to Cradle® institute (Braungart) has designated the lime pellets as ‘recycled process input’, so that they can be used as raw materials for companies seeking a Cradle to Cradle CertifiedTM label for their product. A good example is the incorporation of drinking water lime into Desso EcoBase® carpet backing.